Take a test drive of the TNSR solution that is best for you and see how it can set your network free. Purchase TNSR after the completion of your trial testing. After the completion of your trial testing contact sales or your sales representative directly for purchasing. TNSR Business is designed for users who want a full-featured secure networking solution that scales. 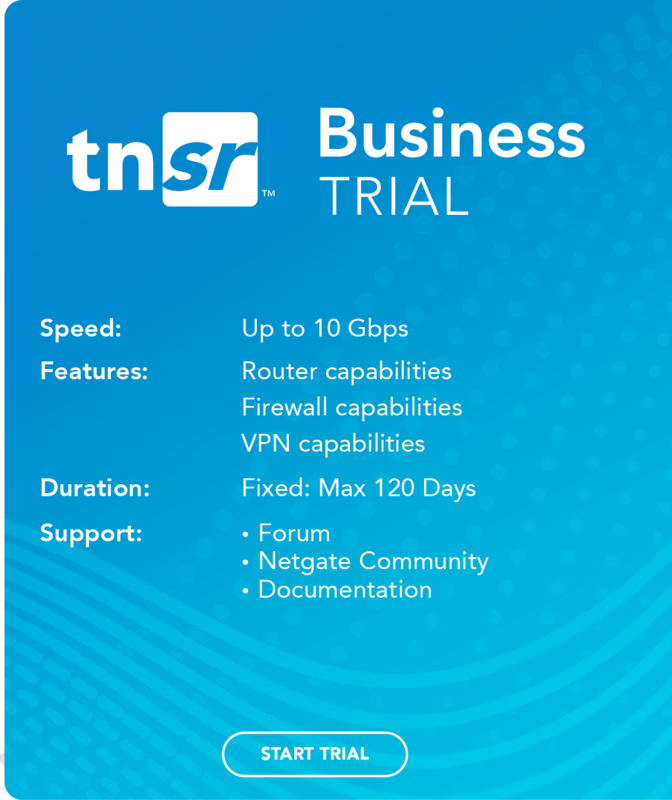 Ideal for deployments where up to 10Gbps NIC instances are present, TNSR Business is suitable for everyone from Small Office/Home Office (SOHO) to labs, branch offices, virtual offices, or retail stores. Equipped with a RESTCONF API, TNSR Business also enables low-cost, no-touch orchestration management. TNSR Business comes as an annual software subscription licensed as a bare metal image, VM, or pre-loaded on a supported Network Appliance. For bare metal image and VM deployment, a hardware compatibility list is available in our documentation here. TNSR Business is also available for deployment on Amazon Web Services and Microsoft Azure Cloud Service Providers. Business Technical Assistance is bundled into the annual subscription. For users in need of a faster response SLA, an upgrade to TNSR Business Plus is available. TNSR Enterprise is designed for enterprise and service provider users who need a fully-featured secure networking software solution. TNSR Enterprise is the right choice for applications where NIC speeds exceed 10 Gbps. 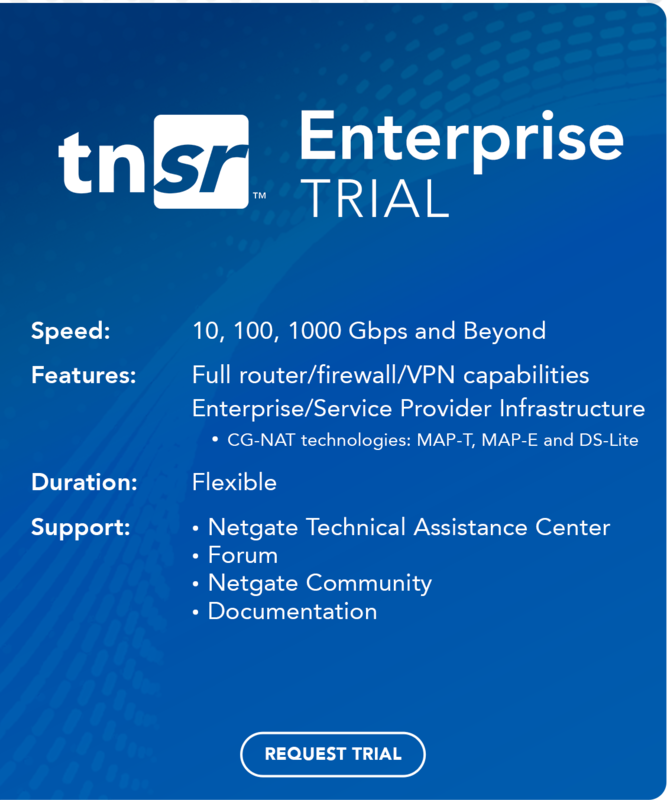 Large-scale networks will see additional benefits from TNSR Enterprise features like carrier-grade NAT. Equipped with a RESTCONF API, TNSR Enterprise fully empowers low-cost, no-touch orchestration management. TNSR Enterprise is provided as an annual software subscription licensed as a bare metal image or VM. For bare metal image and VM deployment, a hardware compatibility list is available in our documentation here. TNSR Enterprise is also available for deployment on Amazon Web Services and Microsoft Azure Cloud Service Providers. TNSR Enterprise Technical Assistance is bundled into the annual subscription. Want to know more before you try? If you are not completely sure of what it is you are trying, head on over to our product page to better understand TNSR. Learn about the ways TNSR can set your network free and how it does it.